Mayor Bloomberg has been pushing to rebuild and reopen a shuttered marine garbage transfer station (MTS) in the Manhattan neighborhood of Yorkville since 2002. Many nearby residents vociferously oppose the plan because the old MTS locally worsened air quality, noise pollution, and led to foul garbage smells, and they anticipate similar or worse problems with the new, larger MTS. As an oceanographer and resident of Yorkville, I am writing with a dissenting viewpoint that’s sure to start some trash talking. In 1999 the MTS was shuttered because of decreasing use, after the Staten Island Fresh Kills landfill was closed. Since then, trash has typically been driven through less affluent communities and transferred to long-haul trucks for shipment to other states as far off as South Carolina. If the MTS is rebuilt and reopened, garbage trucks from most of the eastern half of Manhattan will converge at the MTS on 91st Street at East River, where garbage will be transferred inside a closed building to sealed shipping containers and placed on barges for long-distance transport. This would reduce city-wide truck traffic and air pollution, and (in the long-run) save a lot of money. It would also address the injustice of trucking most of Manhattan’s trash to low-income communities (Newark and Jersey City). Map showing the site of the existing marine garbage transfer station (MTS), where a new expanded facility is scheduled to begin construction in 2012. The project is under appeal. The MTS’s opponents have been distributing printouts of a new letter around the community that can be signed and sent to the National Oceanic and Atmospheric Administration (NOAA). This latest effort to stop the MTS collides with my area of expertise, oceanography — they are claiming that the “delicate ecosystem” of the East River will be badly harmed, and that this threatens striped bass fish. 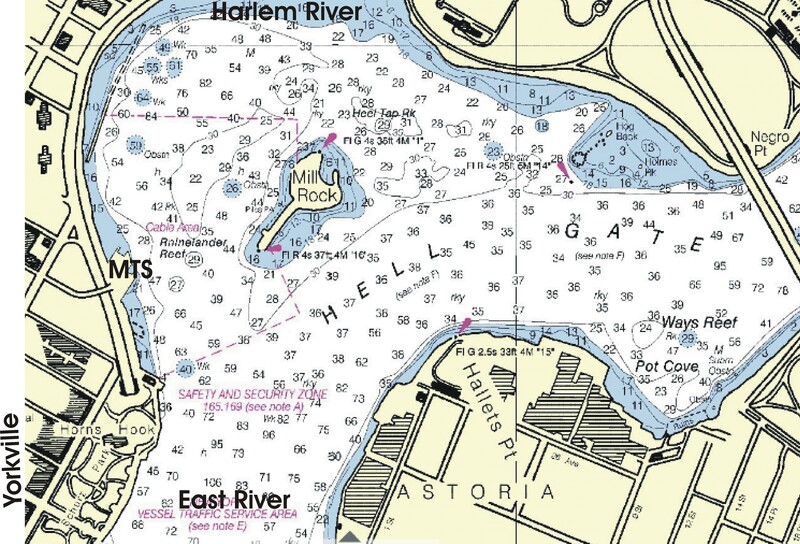 The East River is not a “delicate ecosystem”, as the letter claims – it is a heavily urbanized waterway, with large boat wake waves and strong, dispersive tidal currents. Striped bass aren’t likely to be vulnerable to the proposed increase in activity, nor the development’s relatively small footprint. They lay their eggs elsewhere, in freshwater, and the striped bass found here are large and strong enough to evade boat traffic. Moreover, there is a much more compelling set of factors that should override the delicate ecosystem argument. Opening the new MTS will prevent substantial carbon dioxide (CO2) emissions that currently result from trucking garbage over long distances within and beyond NYC. CO2 emissions are enhancing the greenhouse effect, causing global warming of the atmosphere and ocean. This ocean warming is pushing fish like striped bass poleward to find cooler waters, and threatens to eliminate the world’s immobile ecosystems, such as coral reefs. The heating of the ocean and melting of glaciers cause sea level rise, which should be a very serious concern for this low-lying neighborhood. Sea level around NYC is expected to rise between 1 and 4.5 feet by 2085, raising flood levels for coastal storms like Hurricane Irene higher and giving them much greater destructive potential. Seawater briefly surged over city seawalls during tropical storm Irene, an approximately 1-in-10 year coastal flooding event. Water levels for a 100-year event are thought to be about 2.5 feet higher, and sea level rise will add 1 to 4.5 feet to that height by 2085. Furthermore, CO2 is causing ocean acidification, with poorly understood but potentially profound implications – the world’s oceans are already 30 percent more acidic than in pre-industrial times, and is projected to become a factor of 2 to 2.5 times more acidic in the next 100 years if we don’t dramatically reduce our emissions. For those who care about delicate ecosystems: CO2 makes seawater more corrosive for many of the microscopic organisms that form the base of the food chain. None of this is new to several prominent environmental groups that have spoken up to support the marine transfer station, including the NY League of Conservation Voters, the Natural Resources Defense Council, the Organization of Waterfront Neighborhoods and Environmental Defense Fund. And it also has the support of New York City environmental justice advocates. New Yorkers can take pride that Mayor Bloomberg is the chair of a coalition of 58 major global cities taking action as the Cities Climate Leadership Group. 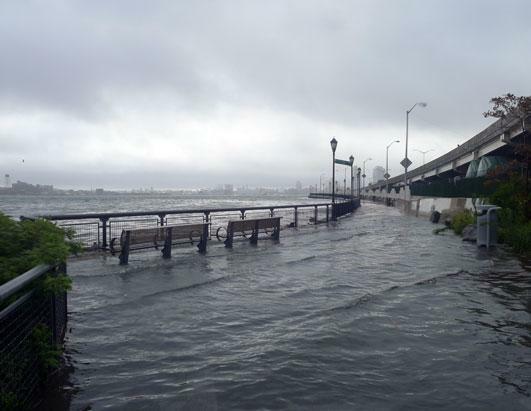 Global warming is a major concern for Bloomberg, in part because we are a city of islands and sea level rise may eventually force the city to rebuild low-lying infrastructure like FDR drive where it passes by Yorkville. As always, the steps we are taking in NYC are having a much broader, global influence. The MTS is an important part of PlaNYC 2030, which prepares the city for expected population growth, improves NYC air quality, and helps reduce global warming, sea level rise and ocean acidification. Detailed information on the MTS and the broader Solid Waste Management Plan is available on the NYC Department of Sanitation website. I recommend people get involved and read the plans for themselves, as I’ve personally found them to be highly detailed and address most of the concerns residents have raised about the project. While we must be vigilant and hold the Department of Sanitation to their commitments to maintain a healthy and clean local environment, residents should support the MTS plan because there are concrete, long-term benefits for Yorkville, NYC, and people and ecosystems around the globe. This entry was posted in climate, opinion, water, water pollution and tagged 91st Street, acidification, barge, Bloomberg, East River, ecosystem, environment, garbage, justice, MTS, New York City, sea level rise, striped bass, Upper East Side, Yorkville. Bookmark the permalink. Great essay. A real pleasure to see a thought-out non-NIMBY response. yes! kudos! MTS are important to our city. We rely too much on trucking and far too little on water transportation of everything: not just for the city’s wastes and recyclables, but for consumables, as well. Yes, you may live near a working dock which unloads goods and regional produce or takes away our garbage, working through the night, bringing traffic which cuts across the bike lanes and parks. But this is the city–best served by a mixed-use waterfront. The ‘necklace of green’ with luxury buildings of unobstructed views does not ultimately serve our city well. A response Op-Ed was posted in Our Town three weeks after mine, and it’s worth posting a link here … judge for yourself if the writer adequately rebutted my points or had a reasonable point-of-view. Also note my comment at the end in the Comments Section. I am president of Residents for Sane Trash Solutions (RFSTS), an organization of community residents committed to rational solutions for the city’s trash that are healthy and fair. The inaccuracies in Philip Orton’s recent article, “Garbage Transfer Stations and Delicate Ecosystems” (Dec. 1), caught my eye. Orton suggested that the proposed Marine Transfer Station (MTS) on East 91st Street would cause no significant environmental impact to our densely populated, residential neighborhood. The facts clearly do not support his position. Right now, about three-quarters of all of the waste that New Yorkers create goes to the South Bronx, Williamsburg-Greenpoint, and Jamaica, Queens. Even if they are less densely populated, these communities have kids, elders and other vulnerable populations and they get stuck with a far greater amount of the city’s waste (not to mention other burdens) than the East 91st Street MTS would handle. It is fundamentally unfair to put the burden on these communities because they happen to be less densely populated. There is no way to eliminate human exposure to the environmental impacts of managing waste; wherever we send it in the city it will affect people—people on truck routes and people near the facilities. That said, the MTS system will significantly reduce those impacts over the near future. It would be great if folks could focus their energy on long-term solutions that would reduce the impact for everyone, like reducing the waste stream and improving upon the city’s woeful 15 percent recycling rate. It is worth mentioning that the trucks going to this MTS are collection trucks picking up garbage generated in and around the UES. Eliminating the MTS will not eliminate the need for these trucks. Glad you are not worried about the fish. I am worried about the 280 and growing elementary school students whose public school is less than 2 blocks away (projected enrollment 700 students). The 400 elementary and middle school parochial students 3 blocks away. The 300 middle school students 1 block away. The new public elementary school to be opened 1 block away (projected full capacity enrollment 600 students). The 100 students at a private special needs school 1 block away. The two private nursery schools that serve over 400 children under the age 5 3 blocks away. The nursery/day care that serves over 100 children under the age of 5 1 block away. Not to mention the public playground on the other side of the proposed ramp entrance, the 2 public parks and the non-profit fitness facility that has thousands of visitors including elderly and children that this proposed travesty will bisect. Finally, though out of your area of expertise, you might want to tackle the public safety questions associated with mixing hundreds of large vehicles with hundreds of young children. You do not need a doctorate in common sense to see that with the number of young children within blocks of this facility the proposed MTS station has extremely dangerous consequences. I haven’t missed the point, and I do understand and respect the concerns about children and people in general. The Op-Ed mainly responded to the letter to NOAA that has been plastered in front of my apartment elevator and on a table with anti-MTS materials for the past four months. I eventually felt that as an oceanographer I needed to speak up about the false claim and (justification for dismissal) that this was bad for the ecosystem. I do see there are much deeper community concerns than the fish – that’s hard to miss. This is an interesting “my environment” versus “global environment” debate, and both sides have worthy points. Sorry we don’t see eye-to-eye on this one. Whether or not the MTS gets re-opened, I hope we can all join forces to reduce NYC trash and its impacts on people and the environment in future years.